Miki Gavrielov is one of the most loved, cherished, and popular singers in Israel. He was born in Israel, Tel Aviv, in 1949. 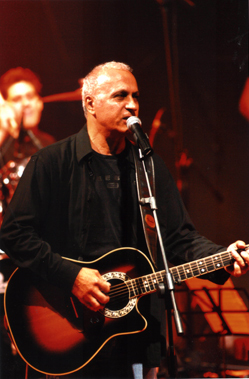 Miki is one of the founders of Israeli music, and he continues to play a major role in the development of the cultural and musical life of Israel. He began his career primarily as a songwriter, but through the years has enlarged his role to include performing as well. Miki’s achievements have been matched by steadily increasing public recognition. His songs are sung by other top Israeli singers, as well as by himself, but most of all by the people of Israel. Miki Gavrielov’s songs are sung throughout the world, from the Philippines to Sweden to the USA. he was honored by the Israeli organization of writers and composers “Acum” with the Composer award in 1991 and with the Lifetime Achievement in Music award in 2007 He has composed over 800 songs, and has released 15 solo albums and collaborated with other singers on another 18 albums.